Certain flavors are classic, and certain flavors are simply a foodie’s best friend. Flavors that challenge the senses and bend the mind are usually lots of fun, and entice the adventurous to try even more. 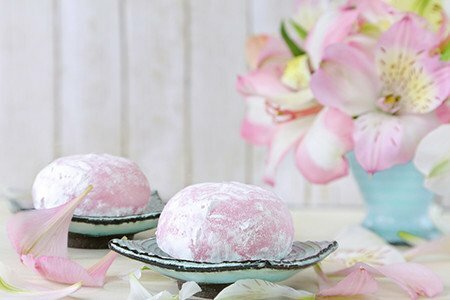 Mochi is available in dozens of flavors all over the world, but some flavors have been more popular than others, more interesting than others, and some are simply waiting for you to fall in love. Chocolate has made quite the journey since first being discovered and used by the indigenous people of the Yucatan Peninsula hundreds of years ago. Chocolate from Central and Eastern Europe is considered a world-class confexion. Chocolate made it all the way to Japan and Korea, where chocolate mochi is a favorite across both countries. Yet another bright flavor originating in present-day Mexico, Vanilla has a reputation of being a ‘safe’ or ‘plain’ flavor, while still retaining its strong, cream-like taste. Vanilla is a flavor that is probably more popular than chocolate! With Vanilla and Chocolate, Strawberry makes Neapolitan ice cream, a crowd-pleaser from 19th-century Italy. Strawberry ice cream itself is one of the main drivers in the artificial strawberry flavoring industry. Like Chocolate and Vanilla, Strawberry is considered an all-American favorite, and very commonly seen in cakes, pies, and cones across the nation. The world’s most popular fruit is one of the most popular flavors throughout Asia. With a tendency to be more tangy than sweet, mango ice cream is sometimes combined with a scoop of vanilla to mellow the vibrant mango flavor. Tea-flavored treats are popular in both Europe and Asia. Matcha is a special type of green tea that is fermented and used in tea ceremonies in Japan. Matcha is a fine power of tea leaves that is bitter with a strong bitter-sweet aftertaste, a perfect flavor for ice cream because the flavor is strong, and accessing the tea is easy. Taro is a root vegetable native to the African continent, and several countries in South Asia. Taro root is a staple food that provides carbohydrates and potassium. It is a rich purple color, and very subtly sweet. Taro root appears in a variety of savory dishes, and is a popular choice in both mochi and soft serve. Durian is a distinctive fruit that grows in Taiwan and China. With an incredibly strong odor, the opening and eating of Durian fruit is disallowed in some places, as some people find the smell unpleasant. Durian itself is nutritious, and boasts a flavor that’s been described as bitter, and almond-like. A flavor that surprises even adventurous foodies, the flavor of Black Sesame ice cream is a cross between mocha and red bean. The almost-coffee is sometimes serves gritty, as the Black Sesame can be coarsely or finely ground, and mixed in. Sesame seeds are a great source of oil, protein, and fiber, and are nutritional powerhouses. A signature flavor in Japan and Korea, red bean is, as much as it seems, a little red bean. Though highly nutritious, the Azuki bean is typically boiled, and made into a paste. The paste made from red beans is sweetened, and used in pastries, ice cream, and on top of fruit and jello.